Coconut oil is one of the most versatile products in the world. You can use it to cook your food in, to make desserts, as a hair mask, moisturizer, massage oil, mouthwash and so much more. It’s rich in MCT’s: fatty acids that are packed with health benefits. But do you know that there are several kinds of coconut oil and that the differences in quality are really big? In this article I explain about the different types of coconut oil, their processing methods and nutritional value. Virgin, refined, expeller-pressed, liquid, RBD, centrifuged, fractionated, extra-virgin and cold-pressed. These are some of the names you might have seen on coconut oil labels. Let’s look into what they are, which ones are the healthiest and what you can use them for. The two main types of coconut oil are virgin and refined. All other coconut oil types fall into one of these two categories. This coconut oil is made from fresh coconut meat. It has the characteristic coconut taste and smell. This is the purest, highest quality and most natural one. It’s also known as unrefined coconut oil. You can use it internally as well as externally for skin and hair treatments, and for oil pulling. The flavor and nutritional value depend on the production method. More about that in a bit. This coconut oil is made from copra, which is dried coconut meat. It has a neutral taste and smell. The quality varies a lot, depending on the coconuts and the production method. Make sure to always buy organic refined coconut oil from a brand you trust. The good: an organic refined oil from quality coconuts and without chemicals, is fine to use. Expeller-pressed refined coconut oil is the best oil in the refined category. Refined coconut oil is even more resistant to heat than virgin. This makes it very suitable for high-temperature cooking. Since it has a neutral flavor, it’s also very versatile to cook with. In order to get rid of all the dirt and to make them look clean, they go through a lot of chemical processing. The final product is downright bad for you and the environment. The ugly: currently there are no international quality regulations for coconut oil. This means that anyone can basically put whichever claim they want on their label. Make sure to research the producer’s website and contact them with questions if you can’t find the answers. If you’ve found a brand that you know and trust, stick to it. 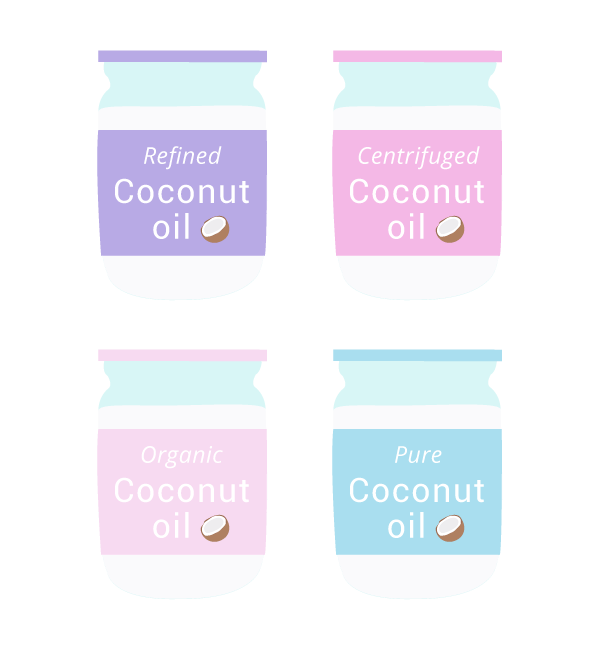 In my article about how to choose the best refined coconut oil I explain what color and texture can tell you about the quality. A different name for virgin coconut oil. The names virgin and extra-virgin originated in the olive oil industry. It’s based on strict regulations related to extraction methods and acidity levels of the oil. There is a lot of difference between virgin and extra-virgin olive oil. These regulations don’t apply to coconut oil, however the name extra virgin is often used to indicate superior quality. Some coconut brands use it to describe what they call the first pressing of the oil. This is short for virgin coconut oil. This is short for extra virgin coconut oil. Virgin coconut oil made from grated fresh coconut meat. They press it in a carefully controlled heat environment not exceeding 49° C / 120° F.
Cold pressing is often manual work which results in smaller batches. Out of the different types of pressed coconut oil this one is more nutritious than expeller-pressed. The taste differs depending on pressure and temperature during production. Lower temperatures and more delicate processing result in mild flavors. Higher temperatures combined with low moisture result in more pronounced ‘’toasted’’ flavors. I wrote an article about how they make cold-pressed virgin coconut oil in Bali. It includes step by step photos of the whole process. This is virgin coconut oil made from fresh coconut meat which is pressed into a coconut cream. It happens in a machine that uses chilled water to cool it and keep the temperatures as low as possible. Centrifugation concentrates the cream by separating the water and proteins. This type of oil has a very mild, light taste. Many people consider this the most superior quality of all the different types of coconut oil in the world. Its gentle way of processing results in maximum nutritional value. Centrifuged oil is a more exclusive oil that is usually produced in small quantities. Virgin oil that can be produced in different ways such as centrifugation and cold-pressing. It doesn’t exceed temperatures of 45° C / 113° F during production. Virgin oil from fresh coconut meat that is pressed in mechanical expeller presses. It’s less nutritious than cold-pressed virgin oil, but it enables the production of larger quantities in a shorter period of time. Virgin or refined oil from coconuts that are grown and processed organically, without the use of chemicals, fertilizers, insecticides etc. Organic is especially important when buying refined oil, which I explain here. Virgin oil is usually made without chemicals, but refined oil needs a lot of purification. This is possible by using natural methods or with chemicals. Always use the first option. Virgin oil made from the whole coconut meat including the thin brown peel. This type of coconut oil has a slightly nuttier taste. This is refined coconut oil that is refined, bleached and deodorized. You can do this with or without chemicals. Bleaching is possible through a filter process with clay and deodorizing with steam. Unless it’s clearly specified that no chemicals were used, all we know is that it’s refined oil. Refined coconut oil from dried coconut meat that is pressed in mechanical expeller presses with temperatures of around 99° C / 210° F.
After the pressing they filter the oil to get any possible dirt out. They don’t use chemicals during production, which results in a good quality refined oil. Some foods such as corn or soy are often genetically modified. To differentiate between GMO and non-GMO, a natural corn for example can be labeled as organic, non-GMO corn. 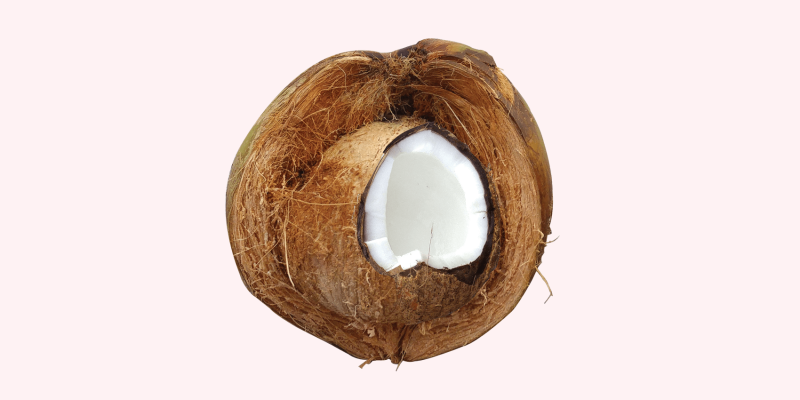 Up until now coconuts have always been natural and not genetically modified. This makes all types of coconut oil non-GMO as well. This one is very open for interpretation and that’s misleading. Does it mean that it’s not mixed with other oils or ingredients? That it doesn’t contain chemicals? Unless specified, it’s not clear if this oil is refined, unrefined, how it’s produced etc. If a label only says pure coconut oil, it’s usually not an indication of a high quality oil. A type of processed coconut oil that has had the Lauric acid removed. This results in an oil that always stays liquid, even when refrigerated. Lauric acid is one of the main components of coconut oil. It helps with a healthy immune system and is naturally present in breast milk. Natural coconut oil is very adaptive to temperatures. It has a melting point of 24° C / 76° F when it becomes liquid. When the temperatures go down, the oil becomes solid. Removing the Lauric acid is not easy and it usually requires chemical processing. 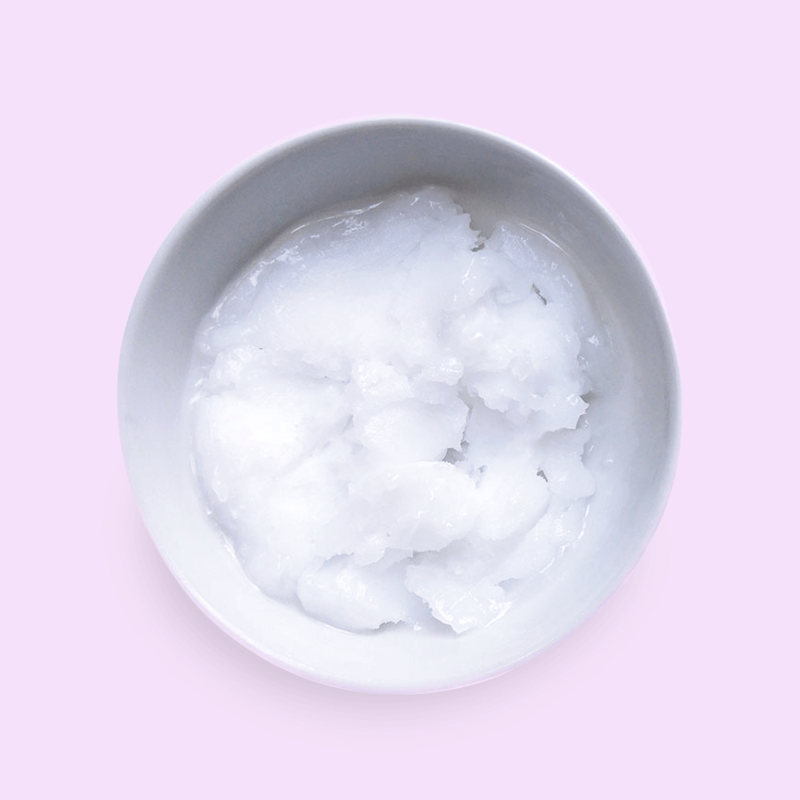 It’s important to know that Lauric acid makes coconut oil the most heat-stable oil in the world. The other fatty acids are not resistant to high temperatures. The product Liquid Coconut Oil is very sensitive to oxidation and not healthy to cook with. This oil is known in the beauty industry as fractionated coconut oil. It can serve as a carrier oil to mix other ingredients with. This is coconut oil in a spray bottle mixed with a long list of ingredients to help the oil get out of the container. 1. Propellants, which are derived from both mineral and natural gases. 2. Dimemythlpolysiloxane, also known as Aspolydimethylsiloxane a chemical that’s often used in cosmetics. That doesn’t sound like anything that I want in or on my body. Spraying your oil might seem convenient, but it’s really not worth risking your health for. More about why it’s better not to use coconut cooking spray and how to apply virgin coconut oil as anti-stick instead. A type of processed coconut oil from the beauty industry. Unlike natural coconut oil, it always stays liquid because it doesn’t contain Lauric acid. Due to its liquid consistency, it easily mixes with other ingredients. However it lacks some of the main health benefits of natural coconut oil. There are different types of coconut oil that you can use for beauty treatments. I always use virgin coconut oil, but sometimes it’s just more practical to use fractionated coconut oil instead. If you do, make sure to use a good quality one! See also liquid coconut oil. Out of all the different types of coconut oil, you won’t likely find this one sold as a consumer product. You can however see it on the ingredients list of some food. Hydrogenated oils are used to prevent some products such as candies from melting. To do this, they chemically alter the unsaturated fats in coconut oil. This results in trans fats which are dangerous for your health. This type of coconut oil is part of the ‘’Fair for Life’’ concept. It stands for fair pay, safe working conditions and community projects for the workers. Coconut oil is vegan and is not tested on animals. Some coconut producers use chained monkeys to pick coconuts because they work much faster and cost less than people. Luckily there is increased attention to this saddening, unethical practice. Please make it your priority to support cruelty-free coconut brands. Do you want more in-depth information about the different types of coconut oil? 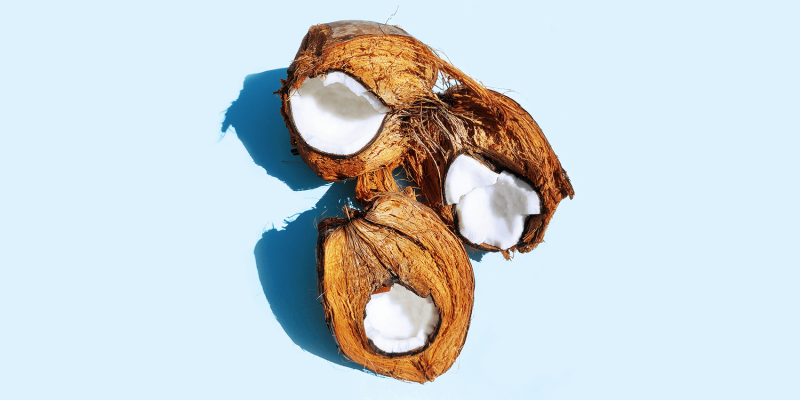 Take a look at the virgin coconut oil guide and the refined coconut oil guide.